I received a sample of this beer last month from Flying Dog Brewery. Coincidentally it arrived at my home while I was actually in Denver, on the same day I happened to be visiting the brewery's office. (You regular readers will know that the Flying Dog brewery is now in Maryland though the company still has offices in Denver.) I forgot about the bottle until today. 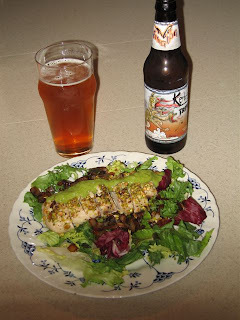 Colleen prepared a pistachio encrusted chicken breast salad with guacamole and caramelized onions for dinner and the tripel seemed like a good choice to enjoy with the meal. The beer pours a golden orange color with a thin white head that rapidly drops. The aroma is that of clove, banana, with some bready notes. The taste has the expected banana and pepper flavors and is slightly sweet up front. A strong hop presence comes through in the finish. There's a bit of alcohol detected, although it's not quite as prominent as one might expect from the brewery's big beers. Flying Dog Kerberos Tripel is part of the brewery's Canis Major series. Better be careful as the 8.5% ABV could sneak up on you. The finish is dry with some lingering mild bitterness. The Kerberos Tripel indeed went well with the food. The dish was slightly spicy and the caramelized onions provided some sweetness. The mild sweetness of the beer, along with pepper spiciness, and the bitter hop finish, matched well to the varied flavors in the meal. Two other beers in the Canis Major Series, Double Dog Pale Ale and Gonzo Imperial Porter were review previously. I do have the fourth, Horn Dog Barley Wine, waiting for me downstairs. I'll surely be having it soon. As a fan of "big beers" I've enjoyed this series from Flying Dog. Thanks for the review! If you can, block out Sept 13 on your calendar - we'll be having GonzoFest at the brewery that day. Beer, bands and the Maryland Chili Cook-off Championships.